Ads are selected to be served based on their CTR, quality coefficient, and click bid. Ads with the highest performance indicators end up in premium placement. A click forecast is used to calculate CTR. This forecast is based on accumulated impression and click statistics for keywords, as well as for other parameters that affect the likelihood of a click, such as the presence of search terms in an ad text, user behavior in a display region, and so on. The quality coefficient takes many factors into account, including the relevance of the ad to the query, the ad statistics, relevance of the ad to the landing page, etc. That way you can ensure that your ad will get more traffic not only because you increased your bids, but also because your ads are performing better. 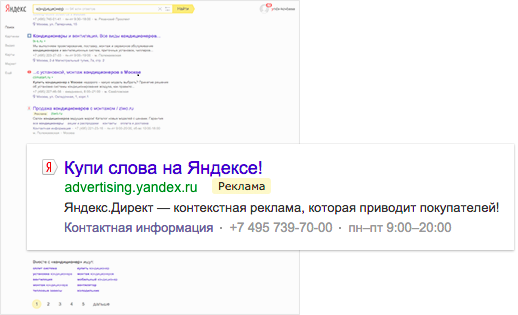 The number of ads in search results depends on the device on which the ad will be displayed. This block is located below the search results. 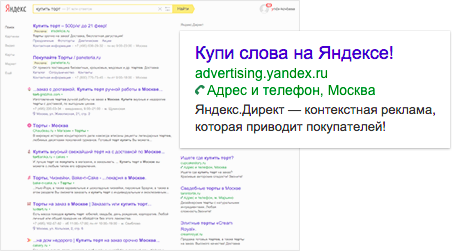 Ads displayed in this block generate the highest number of clicks. Ads that don't end up in premium placement may be served under or to the right of the search results.